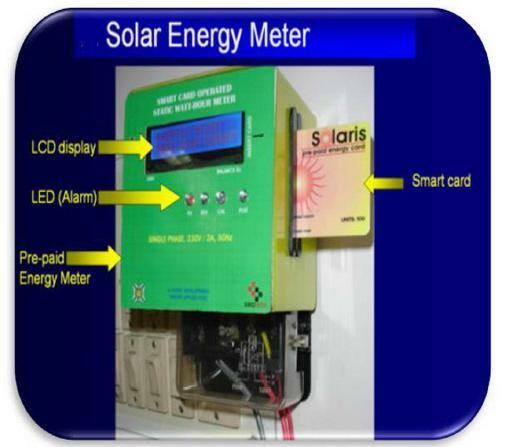 PREPAID SMART CARD OPERATED ELECTRONICS ENERGY METER WITH ONLINE LOAD OPTIMIZER FOR SOLAR POWER APPLICATION. technology manage optimal load dispatch through an in built programmable load limiter to avoid grid collapse due to over load. recharge in terms to KWH to limit load based on seasonal condition. The card selling , supervision and training to the consumer about new technology may lead to a good business model for employment of Indian rural population where technology awareness is poor. The battery powered card recharger may be fitted on a bicycle for card recharging / selling at the consumers’ door step which may be a more effective model of business and technology promotion in remote areas. This may help to remove any unauthorized electricity connection violating the rule. Status of Commercialization: Technology is licensed for commercialization to one Indian Industry. Techno Economic: Cost effective, affordable and user friendly system. Technology Package: Low power embedded system based energy management system. Level/Scale of Development: Early stage commercial model is ready and working in the laboratory.